In a world where photocopy machines, scanners, and computers can reproduce two-dimensional images within seconds, a raised intaglio image adds tactile, undigitizable protection to documents. More importantly, the pressure generated in the intaglio impression forces the ink into the fibers of the paper. The image is not only tactile as an overt security check, but once dry, the ink will be embedded in the paper. 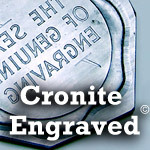 Cronite flat stamping intaglio presses are the most cost effective way to produce an intaglio image. 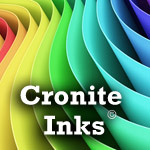 In addition to being vastly less expensive than a rotary intaglio system, Cronite presses are extremely versatile. As with any security printing operation, many layers of both overt and covert protection are added to make a document harder to reproduce. Another layer of protection is gained by using security inks. 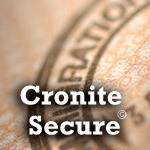 Cronite produces a wide range of inks which can be used in security operations. Please see our Security Ink page for a partial listing.